It’s Spring again! And you know what that means…Summer follows Spring! Hooray for Summer! Spring means planning for Summer. Summer beats Spring like Rock beats Scissor (and that is another entry, another time.) But there’s two things I’ve noticed in the spring air as of late; one, many people are out of work, and two, springtime means many young adults and college students are looking for summer jobs or internships. Well I have conjured a brilliant program that will not just strongly benefit the listed persons above, but will help usher in a new great Phase in the Michael Sanders Empire! If you have not become familiar with my last Phases yet, I would urge you to do some reading on the Tower and the Corner before moving on. All caught up? Great. Moving on. 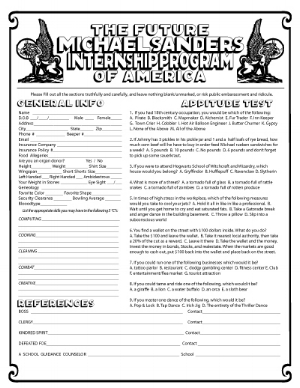 Introducing, The Future Michael Sanders Internship Program of America! Yes, you heard correctly. Follow his every footsteps and gain the knowledge you could never get at a liberal arts college or a fluorescent burnt cubicle. Become a master in design, innovation, invention, and ideation! Feel the winds of creativeness flow through your hair on that Sunday cruise to opportunity. Roost in the Crow’s Nest and keep watch as Michael sleeps. Get deep down in the muck with him as he battles managing multiple clients, a full time job, multiple side project businesses, and a girlfriend. “What will I learn,” you ask? The real question is, what will you not? Among learning creative writing techniques, dance moves, fight dance poses, and how to not die in a fight with a bear, you will ultimately learn about yourself. There will be 15 spots and as of now the program is a non-paying internship. But that is if you don’t count staying in the Tower all summer long as payment of course! Lodging is provided and required. All Future Michael’s will sleep on Michael’s extremely comfortable floor (It’s lined with sheep’s skin and smells like the beard of a wise sherpa chewing on oak leaves.) As for food, fend for yourselves. 7:00AM: Wake Up! (But don’t wake Michael just yet) Start the day off right by journaling out your dreams from the sleep to which you once belonged. 7:15AM: Work out outdoors in the yard. Move stones, balance on logs, etc. 8:30 AM: Sprint to the the Starbucks on the waterfront (only 1.5 miles) and pick up one of their blueberry croissants (toast them please) and a large white mocha latté with skim milk, light foam. 9:00AM: Wake Michael with a joyful song and his blueberry croissant and white mocha latté. 9:40AM: 5 rotated Future Michael’s will run help run the Corner’s Daily business. 9:45AM: The remainder will leave for the office with Michael. All must fit into one car. It is mandatory. For the HOV. 10:30AM: The office work day begins. Each Future Michael is assigned specific tasks like coffee runner, copier boy/girl, pre-press monkey, email screener, number cruncher, funny youtube video finder, Rock Band set up crew, bookie and look out. Each FMer will responsible to write down and later recite funny things Michael says throughout the work day. 12:30PM: One intern will go out and pick up Chipotle for the crew. Their treat. 3:30PM: Razor Scooter circuit races through the building. 6:00PM: All FMers meet back at the Tower for food, fun, and fellowship and a large delicious spaghetti dinner by Michael’s girlfriend. *NOTE* Starting up a game of “cup/slap/pass” or “big booty” will result in being terminated from the program. 8:00PM: The Future Michaels practice their fight dancing skills until the sun goes down. 9:00PM: Michael leads the group on a blindfolded trust wake through a dodgy randomly selected neighborhood. 10:00PM: All will curl up on the den floor and practice our creative writing and read each others stories out loud. 11:00PM: Freestyle dance competition followed my Michael’s coveted lessons and secrets on cutting the rug. 12:00AM: Hostile take over drill! Everyone fortifies the Tower and heads to the Situation Room to discuss Tornado, Zombie, and Terror scenarios. 1:00AM: FMers practice Stealth techniques running from roof top to roof top in the city. 3:00AM: Everyone heads back to the Tower for warm glasses of Milk before bed. So I hope everyone will consider this as an option for their summer. The program is pulsating with opportunity! I have uploaded a PDF of the application. Make sure you fill in every single detail. I expect to receive applicants in the hundreds, so please mail or email it back to me in a timely manner. Thanks! I’ve always wondered what it might be like to have a time capsule. But honestly, in this fast day and age who has the time or patience to find that 20 to 50 year old box in the cold, hard ground filled with marbles and newspaper clippings? I don’t, that’s who! But the idea still intrigues me immensely. That’s why I propose the idea of weekly time capsules or what I’d like to call In-the-mean-Time Capsules. Yes, In-the-mean-Time Capsules. Bury your stuff that is momentarily meaningless to you, but in a week will be like lost treasure to you! It is important to put things in the capsule you would think you go without for just a about a week or so. 1. An extra par of keys. 2. Watched Netflix DVDs. You’d probably wait a week to mail them back anyway. 3. Chapstick. It’s small, it’s cheap, it’s too perfect to not be in this. 4. A new roll of Toilet paper. 6. A bag of your favorite of chips (fun size preferred). 7. A clean pair of clothes. Bank on the fact you’ll be neck deep in dirty laundry, with nothing to wear. 9. Your checkbook - This will keep one from burying the capsule in some common place. The Capsule is worth the risk! 10. Coupons! - One would be so excited, they’d go straight to the grocery store to shop and save. 12. Bills - This one you’ll actually love burying, but not digging up. 13. That funny list or inside joke you scribbled onto a napkin. In a normal time capsule, one would not remember the story, but after being a week in the ground, barrels of laughter will fill your insides again. 14. A can of your favorite soup. (I like Campbell’s Chunky Noodle). 15. Smokes. Then someone can say, “Congratulations! You’ve gone a week without smoking, now move them from the capsule to the trash.” If you go a week then you can go the rest of your life without them. 16. A jump drive. Make sure to put some important papers or files on it as well. 17. Concert Tickets or Wedding Invitations. 18. A squirt gun. No reason; they’re just awesome. 19. The iPhone. Think of this one like fasting; it’s honestly the only way to keep it in the ground. 20. And lastly, a stop watch. SO there you have it. This what I’d put in the ground. Among the world’s greatest rivalries in History, like Pirates and Ninjas, Coke and Pepsi, USA and USSR,etc., there is a great rivalry that needs no other introduction. Everyone knows about the Cold War, but what about the “Warm War” also known as the Dessert War. I speak about cake and pie. When the bakery becomes a battlefield. Sugar is torn in two. Fruit and Crust to the other. But it wasn’t always like this. There was a time when Pie and Cake came from the same oven. They sat next to each other in the Baker’s display case. Until one day someone came between them. Cheesecake. What is Cheesecake? Is it a pie? Or is it a cake? Most people assumed it was cake, but Pie thought differently. After a few bitter and tense years, Pie decided to make a stand against Cake. Cake: “How dare you bring that up! And so that’s how the great Dessert War started. And it’s been quietly raging everyday since. Today is my birthday. It is a large birthday for me; 25 years old (or young.) A third of my life is probably over. I look forward the great adventures, and exploits I will have in the future, but before I become that weathered and aged man with the eye patch, I wish to share with you the Legendary story of my life live so far in this quarter of a century. I now present to you…. Year One: According the accounts of his mother, Michael pointed to the moon in the sky and said his first word,“Sphere.” It was then assumed that this child would accomplish many deeds in his life to come. Year Two: While other babies where crawling, or even walking, Michael scooted with his belly on the floor like the wise serpent. Year Three: Michael scissor kicks his sister in the nose with his Cookie Monster Shoes in her Cabbage Patch tent. When he was spanked by his father, Michael only sheds two tears for the pain caused to the Cookie Monsters on his left and right foot. Year Four: During the family’s pilgrimage to the land of Disney, Michael gets his head stuck in some bars in front of a pond at the Disneyland Hotel. When asked why we was crying, Michael said he was grieving for the wrongful imprisonment of the rare Shubunkin Goldfish. Year Five: Michael fights, tames, and rides his first mountain lion. He names him Brandon. He then spends the majority of the year racing him on BMX tracks. Year Seven: Michael joins his first church gang, the “Coyotes.” They roam surrounding arroyos and gullies playing games like poke the rattlesnake. Year Eight: While other children are playing with their toys, Michael is busy running extensive tests on his own action figures in feats of burial, freezing in water, flight, theater, and of course limb-to-limb transplants. Year Eleven: Michael takes his Walkabout through the New Mexican high desert to become a Man, where he learns about Earth, Wind, Water and Fire. Upon his return he learns that his dear mountain lion ally, Brandon, has fallen ill and passed. In his sorrow and despair, Michael is greeted by a young mammoth of a mammal, the mighty and legendary MOOSE. They became a new supreme alliance. So it is written. Year Twelve: Michael becomes a kingpin on the playground. As a master in marbles, dodgeball, pogs, 4-square, kickball, and Nurf football, he leads other 6th graders in great feats and endeavors. Michael is also involuntarily enrolled into the Awanas program at church. While others are rewarded with badges, trophies, and other awards for scripture memory, he gets a pack of pencils for his “Excellence in Participation” during game time. Year Thirteen: Michael arrives. He is granted excess into the world of the “Youth Group”, as well as the mutinous realm, they call “Middle School.” Michael also notices a striking change in the world; he discovers “Girls!” Michael also joins up with in his school’s elite society called “Falcon Football.” They become city champions going 6-0. In rebellion, or out of pure randomness, Michael dies his hair blood red. By his hispanic football comrades, he is titled “Joto Hair” ( pronounced “hoe-toe”, meaning gay man’s hair in spanish.) But Michael laughs last. Year Fourteen: Michael discovers what it's like to like “descent” music and develops an appetite for Punk Rock, and his life is changes forever. Michael starts to snowboard, but in reverse counterculture, decides that skiing is far superior and continues to destroy ski trails near and abroad. Michael’s world is turned UPSIDE DOWN when he learns that his father will be moving the tribe to the far and distant land unknown to all New Mexicans, the land of Virginia. Michael knows then that he will have to leave his home, where he worked so hard to establish his household name. Year Seventeen: Michael and the Boyz decide to make an avant garde indie film company known only as “Ishbu Productions.” They would, of course, be so far ahead of the times that none of their films would make it to the masses because outlets such as Youtube were not yet in existence. It was also in this year, Michael and some of the crew formed the short lived, mythically legendary Punk band called SCAPEGOAT. They played only a handful of shows, a dozen songs, and would go down in musical infamy. Year Eighteen: Michael finally does his time, and graduates from high school. After turning down multiple scholarships and invites to Ivy Leagues schools, Michael points his sword to the school of Champions, known as Liberty University. He then joins other comrades in the Champion’s legion to be bred to seek and save for Christ. The Boyz become known as the Fredericksburg Crew, once and for all. Year Nineteen: The dark year. Michael’s father, "the" King, passes away later in that year. Michael becomes the sole male heir to the Sanders name. He will do his father proud. Year Twenty: In the wake of the dark time, Michael bounces back in full force. Michael grows stronger physically and mentally. While conquering with an Iron First (which he learned while taking a semester of Karate. Orange Belt; Don’t mess,) Michael finds himself discovering his fiery trade in graphic design. He then travels to far ends of the country seeking knowledge and strength via internships and vacation. While on his stay in a distant paradise, he receives a message that his old mammoth of mammal, MOOSE, has died of a big heart (he also had heart warms.) The Boyz back home conducted the burial. Year Twenty One: Michael graduates from Man to All-Man, by wrestling a rabid brown bear on the top of a school bus full of blind children for three days. Michael and the bear finally declared it a truce, hug it out, and share warm cups of Hazelnut Honey Tea and tell stories to the sightless children. Year Twenty Two: One summer’s day, on a hike in the Blue Ridge Mountains, Michael stumbles upon several golden tablets in the shape of vinyl records. On the tablets are the specific instructions on how to make the perfect dance mixes. With this information, Michael starts throwing the greatest dance parties of all time. Year Twenty Three: Michael begins to work for the University by aiding and advising the Student Funtivities Department in such undertakings as the Worlds Largest Helium-Balloon-Animal parties, bi-monthly white elephant gift exchanges, and seven Family Force Five concerts. As well as aiding the department in events, Michael produces and enforces the Graphic Design and Promotional Coolness and Standards Act (GDPCSA) to keep sucky posters off the University’s walls. Year Twenty Four: Michael graduates and gives a final farewell to the City of Seven Hills and moves his headquarters to the far North of the Commonwealth. He then sets up camp in the city which lies on the cusp of the capitol, which they call Alexandria, (That’s Greek for land of Alexander the Great.) After establishing his stay in the towering palace, many know as the “Tower,” Michael hunts for a job like a starving great wolf stalking a wounded doe. He becomes a “hired gun” of a designer to scrape by. Year Twenty Five: Michael finds his place. While beginning a job as an elite and inspired creative force in a powerful church, Michael sets his mind and will to laying the foundations to a glorious empire. An empire starting off simple, which will grow to such a magnitude, few will truly be able to comprehend it. He wagers that there will be 12 Phases to the empire, which will only be interpreted and relayed through the majesties and the ramblings of a simple blog, from a complex mind. And so, it is written; 25 Years under the large leathery belt of Michael J. Sanders.